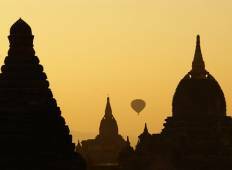 Find a Christmas & New Year trip that explores Myanmar (Burma). There are 61 tours to choose from, that range in length from 3 days up to 18 days. The most popular month for these tours is December, which has the most tour departures. "Fantastic tour. A wonderful country with wonderful people. Saw Lin was fantastic." "I loved this trip. It is a fast paced tour of Myanmar so sure you’re physically..."